With MP275 series, you step in the racing bike world. It's the most advanced series in ASAMA MTB Hardtail range. Pro upgrade of our "Tough" frame, the MP275 frame share the same shapes than its little brother but with all the latest technologies and standards such as a 1.1/8"-1.5" "tapper headset", "E thru" 12x142 rear hub spacing and FW-Tech welds for a seamless finish. It's even dropper post ready if you decide to fit one. Such a quality frame requires top components. RockShox XC30 120mm travel, Shimano Deore 2x10 transmission, Schwalbe tires, Tubeless ready 25mm wide rims mounted on Novatec ball bearing hubs, this bike is a weapon for off road riding. Schwalbe Nobby Nic Performance 27.5*2.25"
For the off-road riders that sweat up technical trails and fly down the mountains over rocks, gaps and roots. They are hardtail and full suspension mountain bikes able to bring you on the wildest trails and enter MTB racing. You will find bikes for cross-country, all-mountain and enduro application in the Full suspension and MTB category. AL6T6: The aluminum alloy used in our frame is top quality imported grade, used by the most famous international brands. The durability of the material highly relies on a good heat treatment process. We believe that our in house equipment and experience with T6 treatment guaranty the best frame strength. HYDROTUBE: Weight reduction and Strength gain at the same time. It's possible thanks to this technology. After mechanical simulation, we can define accurately which area need to be reinforced and which area can be made lighter. Thanks to Hydrotube we can optimize our frames by forming the frame tubes as simulated, adjusting point by point tube thickness and shapes. FW TECH: This complex welding technic gives a smooth aerodynamic feel similar with carbon products. It also increases the strength of the weld by filling all the small porosity and angles seen on a traditional weld seam. 2-1-1: A good bicycle needs to be comfortable and efficient. For that, the frame needs to be vertically compliant (filter shocks) but stiff laterally. By increasing the length of the 2 seat stays and welding them far apart from each other directly on the top tube, we improve the vertical flex while increasing the lateral rigidity. TAPPER HEADSET: The headset is the most important part of a frame in matter of safety. This area withstands directly the rider weight and the shocks from the road. By making it tapper we increase the stiffness greatly. The headset bearing is widened accordingly which improve their durability as well. OVERSIZE BB: The bottom bracket is where most of the pedaling forces are applied. 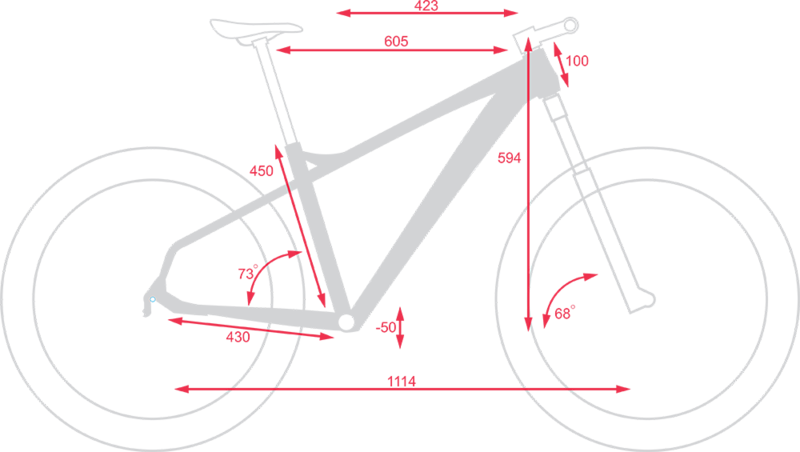 By designing it oversize (73mm) we increase the bearing durability and power transfer to the bicycle. SAFETY INSERT: The rear mesh hanger is designed separately from the frame. It acts as a fuse in case of accident protecting your frame integrity. E THRU: E thru uses a 12mm diameter rear wheel quick release system that go through the frame rear end. Using this oversize axle increases rigidity, accuracy on the rear wheel position and durability of the hub by allowing bigger bearing. DROP READY: The frame is design with the internal routing necessary to fit a stealth type remote controlled dropper post. It allows to change the position of the saddle while riding. Lower it for descending, raise it for climbing by a push on your handlebar remote.